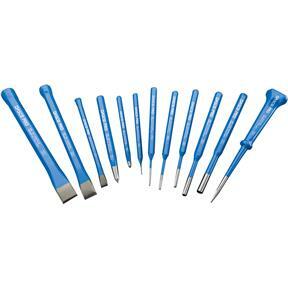 Every important sized cold chisel, center punch and pin punch you'll ever need. This complete set includes 5/16", 5/8", and 3/4" cold chisels, 1/16", 1/8", 5/32", 3/16", 1/4", and 5/16" pin punches and 1/4" and 3/8" center punches. Even includes a 7" scratch awl. Made in the U.S.A.Exceptional Value! Every important sized cold chisel, center punch and pin punch you'll ever need. This complete set includes 5/16", 5/8", and 3/4" cold chisels, 1/16", 1/8", 5/32", 3/16", 1/4", and 5/16" pin punches and 1/4" and 3/8" center punches. Even includes a 7" scratch awl. Made in the U.S.A.